Tallan Noble Latz is Road Tested and Legend Approved!!! "The entire planet needs to see this kid play." ... "I’ve had Tallan on our show for years now. He’s an AWESOME performer! The crowd goes crazy when he plays! He STOLE the show again this year…This kid ROCKS!! !” "
"Life has it's special moments and one of mine was the first time I saw Tallan perform at the Stevie Ray Vaughan Ride and Concert in Dallas, Texas. Watching him perform that day was one of those moments in my life, a special day I'll never forget! It was pure magic and the crowd couldn't get enough of Tallan. He IS the whole package!" 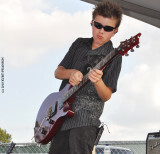 Tallan Noble Latz (aka: T-Man) is a 13-year-old AWARD-WINNING HIGH ENERGY rock/blues/pop guitarist/singer that seems predestined for the big stage. He has been playing music since the age of 3, picking up the guitar for the first time at 4 and finally getting serious about the guitar at age 5. The BUZZ was swirling around Tallan so much that the decision was made for Tallan (age 7) to start fronting his own band. The name of the band became T-Man’s Blues Project and then when Tallan was 8 years old the band named changed to The Tallan Noble Latz Band and it is still called that today. The talk grew and expanded quickly. Tallan (age 8) was asked to do a cameo in the movie, “Wildfire, the Arabian Horse”! This experience gave Tallan the bug to want to explore movie roles more in the future. In 2009, Tallan (age 9) collaborated with the AWARD WINNING musician named Louie Zagoras. Louie recognized immediately that Tallan had something and took him under his wing. With Louie’s guidance they quickly went into the studio to record 5 original songs: Journey Man, Slippin Away, Other World, Kid in the Region and a song for Tallan’s mom called 4U. Tallan then started working harder to carve his place in the Wisconsin music scene and that caught the attention of the fans and the music industry. Together they voted Tallan (age 10) the WAMI's 2010 Rising Star of the Year Award Winner! In 2011, Tallan (age 11) went back into the studio and collaborated with #1 BILLBOARD BLUES ARTIST, Anthony Gomes. Tallan and Anthony did their work at Sawhorse Studios in St. Louis, MO. The collaboration produced 2 songs, one was called Blues Child and the other rightfully named at the time, Blues @ 11. The songs relate to Tallan’s experiences of being so young and being on the road playing music in the adult world. With the addition of top studio musicians Joe Meyer, Preston Hubbard and David Grelle to lay down the groove, allowing Tallan to focus on his guitar and vocal tracks. The tracks were then sent off to WORLD-RENOWED MASTER MIXER Jim Gaines and he mastered the songs and gave us what we have today! 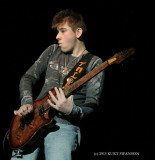 At age 12 Tallan became a sought after guitar clinician and guitar instructor. Tallan partnered with Dangerous Guitars and together they will be releasing Instructional videos and books designed to help the young guitar enthusiast advance quickly, learning the skills it requires to achieve future greatness. Tallan takes great pride in what he does and with his countless hours of practice and his experience of 500+ shows, together it helps him create that perfect musical storm! Tallan takes his music prowess and mixes it with his jaw dropping stage presence to create a MUSICAL EXPERIENCE that very few entertainers at any age can achieve!! NBC's America's Got Talent, CBS' Rachael Ray TV Show, WGN’s Morning Show, Fox’s Morning Show, NBC's Today Show with Kathy Lee and Hoda, CBS’ Early Show, FOX News: Studio B with Shepard Smith, The Bonnie Hunt TV Show, CNN, Milwaukee’s Morning Blend, NBC's Today Show with Meredith Vieira, Chicago's WLS TV Morning Show, Madison’s Urban Theater and Almost Live with Johnny B TV Show are just a few on his impressive list. Tallan has been talked about on news broadcasts and radio programs all over the country and around the world; Tallan was even featured on the BBC segment. His story has appeared in every major newspaper in the country and even some worldwide papers. He was the feature story on Yahoo’s Homepage multiple times! Tallan has received over 25 million YouTube hits on his videos. Tallan also has appeared on TV shows around the world. While in Denmark on tour, Tallan actually appeared on all 3 national TV networks within a 1-week span, which is an unheard of accomplishment for any musician. 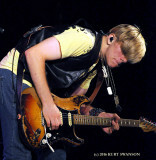 Joe Bonamassa, Buddy Guy, Jonny Lang, Hubert Sumlin, Jackson Browne, Ian Moore, Derek St. Holmes, Van Wilks, Devon Allman, Bryan Lee, Anthony Gomes, Guitar Shorty, Michael Burks, Chris Duarte, Walter Trout, Greg Koch, Albert Cummings, Eric Gales, Wes Jeans, Lance Lopez, Eric Mantel, Louie Zagoras, Tommy Katona, Rob Hunt, Eric McFadden, Bugs Henderson, Pat MacDonald, Chris Aaron, Lonnie Brooks, Wayne Baker Brooks, Ronnie Baker Brooks, Jim Peterik & the Ides of March and JJ Grey & the Mofro to name just a few. 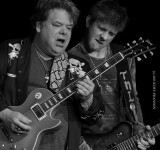 Probably the GREATEST HONOR Tallan has had was the honor of sharing the stage with the LEGEND himself, Mr. Les Paul. At age 8, Tallan was the youngest person to have ever shared the stage with Mr. Paul. Antoine’s (Austin, TX), Ground Zero Blues Club (Clarksdale, MS), Bradley Center (Milwaukee, WI), Kessler Theater (Oak Creek, TX), BB’s Blues Club (St. Louis, MO), Bourbon Street Blues and Boogie Bar (Memphis, TN), The Brat Stop (Kenosha, WI), The Bone (Deep Ellum, TX), Keys Lounge (Ft. Worth, TX), Wild Horse Saloon (Nashville, TN), The Grove (Anaheim, CA), Sundance Saloon (Waukegan, IL), Strokers Bike Shop (Ft. Worth, TX), Pabst Theater (Milwaukee, WI), Alpine Valley (East Troy, WI), Turner Hall (Milwaukee, WI), Maggie Mae’s (Austin, TX), Legendary Tolbert’s (Grapevine, TX), House of Blues (Chicago, IL), Sons of Herman’s Hall (Dallas, TX), BB King's Blues Club (Memphis, TN), House of Blues (Dallas, TX), Cowboy's Dance Hall (Dallas, TX), Anaheim Convention Center (Anaheim, CA), Buddy Guy's Legends (Chicago, IL), Sprague Theater (Elkhorn, WI), Knuckleheads Saloon (Kansas City, MO), J & J Blues Club (Dallas, TX), Summerfest (Milwaukee, WI), Austin's Fuel Room (Libertyville, IL), BB King's in Times Square (NYC, NY), Raue Center for the Performing Arts (Crystal Lake, IL), Milwaukee Art Museum (Milwaukee, WI), The Harley Davidson Museum (Milwaukee, WI), Reno’s Chop Shop Saloon (Dallas, TX), Club 152 (Memphis, TN), Shank Hall (Milwaukee, WI), BB King’s Blues Club (Nashville, TN), BB King's Lucille’s in Times Square (NYC, NY), Brown Theatre (Houston, TX), Dogwood Center for the Performing Arts (Fremont, MI) and Amager Bio (Copenhagen, Denmark) are just a few from a long list of great venues. Ain’t Nuttin But the Blues Fest, Summerfest, Lil Bear Ribfest, Northwest Ohio Rib-Off, Urbana Blues Brews and BBQ Festival, Ozark Blues Fest, Blues Bandits and BBQ Festival, TX State Fair, Bloomin Days, Blues Café, Oak Creek Lion’s Fest, Great American Biker Rally, Round Lake Beach Fest, St. Fabien’s Festival, The PRS Experience, Dallas Guitar Show, Bamfest, Prairie Dog Blues Fest, Lakefront Art Fest, Steel Bridge Songfest, IL Blues Fest, Harley’s 105th Birthday Celebration, Paramount Blues Festival, WI State Fair, NAMM, Children of Fallen Riders Fest, Ruben’s Run, Westmont Blues Fest (Muddy Water's Blues Fest), Northbrook Days, WI Harley Rally, WI/IL Border Rally, Sun Prairie Blues Fest, Jimi Hendrix's 67th Birthday Bash in Times Square and CO-HEADLINED (multiple times) The Stevie Ray Vaughan Ride and Concert in Dallas, TX. These are a few of the festivals already on Tallan’s resume’ and some of these festivals Tallan has made multiple appearances at over the years! While in Denmark, Tallan appeared on multiple TV shows and played at a number of different venues with the highlights being performances at the Odense Internationale Bluesdage and the Frederikshavn Blues Festival. Ultimate Ears, PRS Guitars, Shure Microphones, Mojo Hand FX, Amalfitano Pickups, Ultrasone Headphones, Munder Pedals, Mogami Cables, In-Tune Guitar Picks, Curt Mangan Strings, Morley Pedals, Effects Pedal Boutique, Soulful Impressions, LR Baggs, Diamond Finish, Seymour Duncan Pickups, N-Tune, Graph Tech and Peterson Tuners. Tallan is the YOUNGEST musician that any of these companies have ever endorsed. That speaks volumes of what the industry thinks of his talent and potential. 2013 is poised to be an amazing year for Tallan, as he’s working on multiple projects. Tallan will be headed into the studio and then will be hitting the road in support of the CD release with a nation-wide and possible worldwide tour. Stay tuned for some very exciting news on this musical journey that Tallan will be bringing to his fans! See you all on the road! I think this Guy is a gret guy and should be given the necessary support from evry body. He will defirntely make is country proud and put smiles on the face of the earth. I met and fell in love with Tallan last April and he has come so far. I love seeing him on all of the websites. Tallan Rocks!! He's come so far in less than a year!